Dubai: it's me! in the UAE! 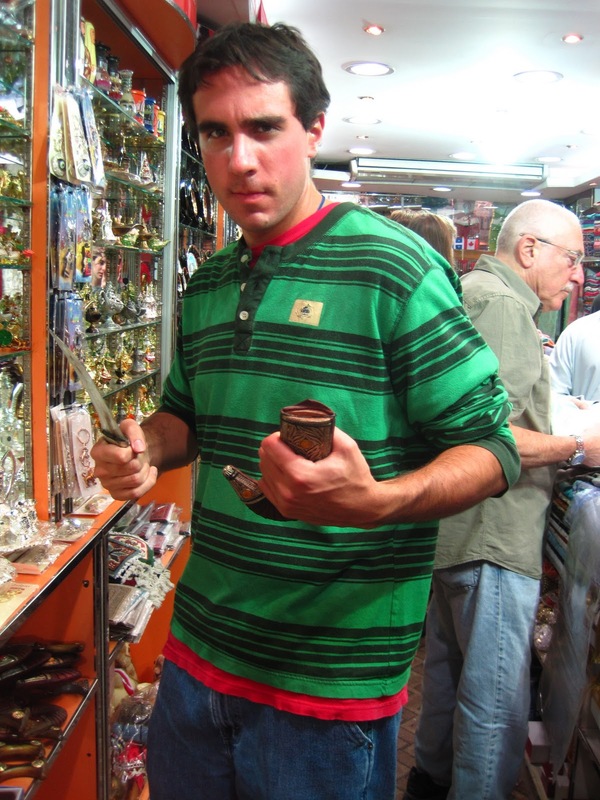 Studying abroad in Dubai this winter quarter! The links on the right hand side will guide you to the different posts I've done so far throughout my trip here. Feel free to comment or suggest new Dubai post ideas! This is a display of the materials that were used to make inks and papers and dies in the past. At the Juma Al Majid Center for Culture and Heritage, they now use similar techniques to restore old manuscripts. Dr. Mustafa and Dr. Tom met us there. 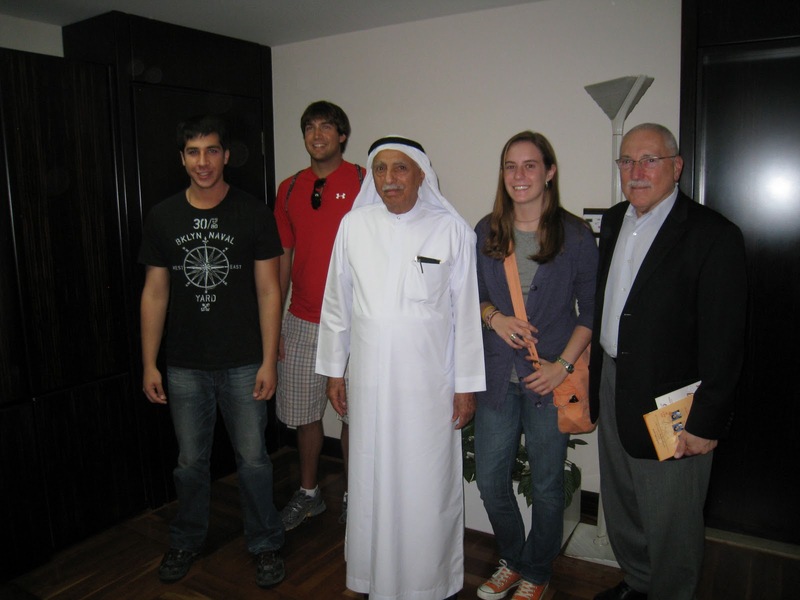 We spoke with His Excellency Juma' Al Majid himself and his assistant. They had us all sit at this long wooden table with really comfy chairs around it. Majid talked to us for a while and his employees brought out water and tea during our conversations. These are pictures of Juma Al Majid with different Sheikhs of the region. There was another wall of Al Majid pictured with different presidents of the world. So basically, from what I could gather, this guy is kind of a big deal. "The researcher who spent half of his life for writing a book, travelling East and West, facing obstacles and difficulties, doesn't he deserve now as we have strength, health, and wealth to try hard for keeping this great valuable heritage which represents the result of those researchers for serving them and the scholars?!" Basically, Majid's idea is that books belong to all human beings. If someone needs a book for research, they should be able to obtain the information in the book without having to travel to another country. So he has been collecting manuscripts from the entire world and digitalizing them and preserving them. From left: Mike Baer, Andy Thistle, Juma Al Majid, Me, Dr. Tom. He also used his money to start a school which had 10 thosand students. The school is only about 140 dollars a year but if the kids are too poor to pay it, he pays it for them, out of pocket. (He pays for about 400 students right now). The college he started has 3200 students, 2200 are females. He’s done a ton of stuff. The entire Qu'ran is etched into this set of stones. You can just barely see the Arabic writing. The characters are so super tiny. We got a tour of all the manuscripts and old documents rooms. They showed us where they digitalize old manuscripts and where they store copies of old manuscripts and some of the originals. There is even a section dedicated to personal libraries that have been donated to the Center. The personal libraries are kept in the same way they are donated. For example, they stay in the same order on the same bookshelf that was originally in the family's house. I took a lot of pictures. They had a photographer following the group around the whole time too. So intense. Here is a link to the website for the Center for Culture and Heritage. One of the super old Qur'ans that is kept at the Culture and Heritage Center. Some of the pages had actual gold on them. Funny thing is, they could just take this book out and show it to us. It seems like you would want that thing locked away in a moisture sensitive room or something. Making a mess of scarves at Abdul's store. Look at Dr. Tom's face, I can tell he's in bargaining mode. When we weren't bargaining at Abdul's store, we were looking around. Mike (left) found a really scarey looking dagger knife thing that came with a case. 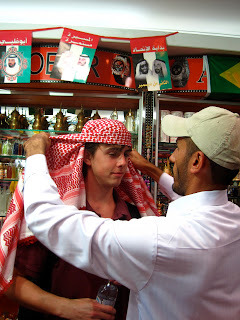 The other guy at the store had Jimmy try on a keffiyeh, or Arab head dress (pictured on the right). I told Jimmy it was his new look. I don't think he bought it though. After the souks, Mike Baer, Stan, Jimmy, Mike Walsh, Steve and I went to Irish Village for some dinner. Irish Village sounds like a small town, but it is in fact a restaurant and bar with and outdoor patio. There was some low key live music and tables to sit at outside. I got this awesome dinner of risotto with chicken. It was so delicious, I wish I had a picture of it. Outdoor patio thing at Irish Village.